I remember first hearing it in an ex-manager's office, years back. We were having one of those music biz conversations, and he must have used the word "swag" three times before I caught on. Straining to understand the full implications of the word, I thought T-shirts, right? Ball caps with the band's name on them. Coffee mugs, but the kind you score for free because you can. Plundered booty. Okay then. The newer dictionaries use synonyms like 'loot' and 'spoils'. But now the word has taken on another meaning that, for me, replaces any prior definition. It's SWAG... the band. 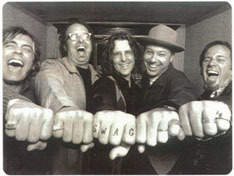 SWAG was loosely formed nearly four years ago as a side project for Mavericks bassist Robert Reynolds and then-Mavs keyboardist Jerry Dale McFadden. With each recording session they enlisted friends to join in and, before long, they had a band. Everyone's musical resumes only added to the buzz. Robert was already a celebrity from The Mavericks, Jerry Dale has been part of the Nashville rock scene since his first solo album in the cowpunk mid-'80s. His most recent solo CD is only a couple years old, but he's still well-known as an in-demand sideman (currently with Sixpence None The Richer). The rest of the core SWAG unit includes Wilco drummer Ken Coomer, Cheap Trick bassist Tom Petersson, and pure pop solo artist Doug Powell. Saying expectations were high is an understatement. Their 'real jobs' may have remained their focus, but they never let the new band fall by the wayside, and SWAG took on a life of its own. With this diverse lineup of country hit-makers, pop auteurs and bona fide rock stars, what does SWAG sound like? The CD, Catch-all, is chock-full of melodic pop with strong rock underpinnings. The songs are all well-crafted (hey, it's Nashville... you can't escape it), but don't feel cliched. The arrangements and sounds are contemporary and classic all at once. There are echoes of the '60s, but that's not a bad thing. While listening to the CD you may hear production motifs and melodic passages that take you back to the best of The Beatles, The Beach Boys circa Pet Sounds, The Zombies, The Animals, even Doug Powell's old boss Todd Rundgren, but nothing that sounds like slavish imitation. It's the spirit that makes the difference. These veteran musicians all know that, and that's a big reason it works so well. SWAG is a band that's been together for four years and managed to squeeze in about 10 live shows total, between their other commitments. That averages out to two and a half gigs a year. Given those odds, any SWAG performance is a must see.